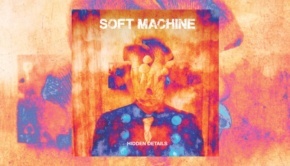 “Always changing, never standing still” is a phrase that as well as tying in nicely with the word “progressive” could easily be applied to Soft Machine, a band linked through markedly different phases, in much the same manner as King Crimson, by name only. By the latter half of 1973 the make up and direction of this pioneering jazz-fusion band was about to undergo yet another seismic shift, in the form of a new member. Ex-Tempest and Nucleus stellar guitarist Allan Holdsworth would be the first six-stringer in the band since the long-gone days of Daevid Allen. Of Holdsworth’s new bandmates, only Mike Ratledge of the original line up remains, and he is joined by the unsurpassable rhythm section of John Marshall and the more recent Hugh Hopper replacement Roy Babbington, those two still going strong today over four decades later as the anchor for Soft Machine Legacy, and last but definitely not least, multi-instrumentalist Karl Jenkins whose arrangement and compositional skills would play an ever more important role in the group. 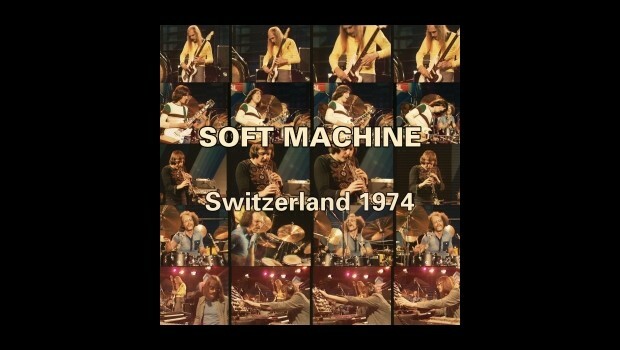 The material that would end up on the Soft’s eighth studio album Bundles, and significantly the first to be given a title, perhaps more to indicate the change of direction than for any aesthetic reason, is here presented in a live set from a gig at the Montreux Jazz Festival on July 4th 1974. Road tested almost since the day of Holdsworth’s joining the band in December 1973, by the time of the Montreux concert the band is as tight as a nut. Widely respected on the international jazz rock scene, the Montreux appearance saw Soft Machine sharing headline billing with the Mahavishnu Orchestra, Billy Cobham’s Spectrum and Larry Coryell’s Eleventh House, and from listening and watching this set the Softs are in no way overshadowed by such illustrious company. Any self-respecting jazz-fusion fan will know the Bundles tracklist inside out, so a track by track description of those that appear on this live set is rather pointless. Suffice to say that Holdsworth’s guitar and the therefore lesser but nonetheless important role played by Jenkins’ reeds have turned the band towards the “rock” end of the jazz spectrum, and it no doubt took their fans by surprise – you can almost hear the traditionalists grumbling from here! However when Jenkins gets to give his reeds a proper blast on an extended version of Peff, it is obvious that he has the chops, and then some. Holdsworth’s soloing is a thing of such technical complexity and dexterity, it is mesmerising to behold. For instance on the track Bundles he begins his solo with an initially bluesy feel before his flying fingers take him and the band off into the stratosphere, the track gliding seamlessly into the gorgeously lyrical Land Of The Bag Snake. From watching his performance here and on the instantly recognisable Hazard Profile, and indeed throughout it may be that Holdsworth had been greedily absorbing the flights of fancy of fellow Yorkshireman John McLaughlin in the earlier first version of co-headliners Mahavishnu Orchestra, as there are moments where Allan’s muse is coming from a similar place. Never really fitting well in to a group context, Holdsworth’s stay in Soft Machine was to be of a similarly short tenure to all his other “sideman” postings, but it seems that this time at least his undoubtedly highly polished technique benefited from the requirements of being a team player, as rarely again would his playing be this emotional. Another band member with a heavy load on his shoulders was Roy Babbington, who had only comparatively recently fully stepped into the daunting shoes of Hugh Hopper, having already contributed double bass alongside Hopper to the albums Fourth and Fifth. His lengthy and progressively more intense self-composed solo piece Ealing Comedy on his signature six-string bass guitar, aided by treatments via Mike Ratledge’s synth is as much a statement of intent as it is a musical showpiece, but I have no doubt the knowledgeable Montreux audience loved it! A storming new interpretation of Riff II from Six ends the main set to a loud ovation and insistent demands for more, which of course are duly granted. If like me you are familiar with this music, the video is what you’re paying the entry price for, and it doesn’t disappoint. Considering this release has been restored from damaged 30-year old archival tapes, the sonics and visuals are superb, and credit must be given to video engineer Douglas Moon, and to ubiquitous sound man Udi Koomran for their sterling efforts. Very occasional sections where restorative work has been of little impact have been left “as is” rather than edited out, given the historical significance of this release. Obviously not intentionally, but somewhat prescient given his diminishing influence in the band, it takes nearly five minutes of the video before we see Mike Ratledge, although his delicate caressing of the keyboard, as witnessed at the mid-point turnaround of the Hazard Profile, and his trademark piercing organ solo at the end of the song tell us the those famous hands had lost none their power to enthral. Allan Holdsworth’s wordless incantation during The Floating World may well be his only vocal performance of a long career, and adds a suitable air of mystery to this meditation from the Orient. John Marshall’s understated but wonderful playing adds to the complex rhythms with percussive flights of fancy, and of course he gets his own spotlight sections on Joint and LBO. Both pieces are composed by the drummer, and the former is a particularly avant piece in tandem with Ratledge’s synth treatments, and LBO proves that his economy of style married to a feel for the complexities of the rhythm are just as hypnotic as Holdsworth’s soaring stringed fantasies. Going beyond a mere road test of tracks for a future album, this gig is a great snapshot of a relatively short-lasting line up of the most important British fusion band of the 70s. A must buy if you are fan, of both the band and the genre.